The Madison Park Essentials Concord Reversible Complete Comforter and Cotton Sheet Set creates a simple yet chic look in your space. The fretwork design creates a modern look with its grey design on a bold purple base. This set is completely reversible to a grey base with purple design allowing you to change the feel of your room instantly. A 180 thread count printed sheet set also features a smaller scale fretwork pattern for a finished look. Great look but . . . It would have been a 5 but the quality isn't as good as I'd hoped. Also the width is about 2 inches too short. I absolutely love this. I was just trying to find an inexpensive comforter temporarily because my last one was starting to come apart. I picked this one because everything o already had was purple so I wanted I stay in that color scheme. This was the one that was the best option in my price point. I ended up loving it. Most of it anyways. The colors and the comforter are wonderful. I just wish the sheets were as soft and comfortable as the comforter. The sheets actually feel like paper. I ended up having to use my old sheets that were purple. They are not an exact match but they feel so much better. If you choose to buy this set I would definitely look for a different sheet set. Still a good price even if you don't use the sheets. This comforter set is even better in person than in the picture (and thought it was pretty striking there!). The colors are as pictured, the quality is excellent and it is truly a buy for the money (looks and feels so much more expensive). I was looking for a purple/gray color palette to add some color dimension to a rather plain bedroom and it has brought life to the room! This comforter is so soft and just the right weight. We keep sleep time about 67 degrees and is a beautiful purple with grey and white accents. We have a king but ordered cal king for a larger fit but truthfully it didn't give much extra. Not sure if we can use the sheets, haven't tried them yet. I didn't realize it was a whole set. I love this set! It's so cute and it's so comfortable! It comes with gray sheets (I didn't know that... probably bc I didn't read it). I'm not using the sheets because I prefer flannel, but I love this set! Color is exactly like the picture. I like the quality of the comforter and sheet set. It also looks great in my room. My daughter has a purple room with a black stripe. This purple/grey reversible comforter makes this almost 18 year old not want to get out of bed because ts so comfy & cuddly. It has such a nice smooth feeling & fluff to it. What a great buy! You can't go wrong with this comforter & it comes in may colors. So loving this set and it is the talk now that I have it on my bed. Love the fact its reversible and the color and design adds charm and allure to my bedroom. Would definitely recommend this set. The price is beyond good and you wont regret this purchase. Looks exactly like the picture. Soft and warm. Only disappointment took longer to get to me. Very luxe feeling. Colors are vibrant. Love this set! Great color, study AND durable. Our doggies ( golden retriever!) are allowed on the bed and there are no tears or holes. Comforter has been washed several times and still looks fantastic! 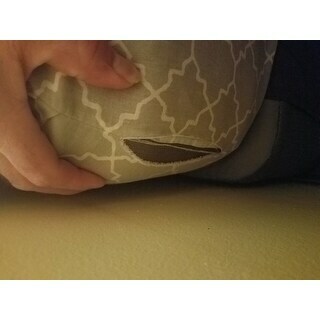 I'm very, very upset, I just received this item, washed the sheets before putting on the bed and they tore right down the seam. Not happy at all, would like a pair of replacement sheets. I mean, I JUST got them the other day. Vibrant colors as on a picture, fit perfect, great price! We bought this purple/gray reversible comforter set for my nieces’ room when we remodeled it. It works perfectly and she loves it! Will always buy from Overstock! "Why can’t at this product into my cart?" "When washed does the purple bleed trough to the gray?" No not at all. I have for almost a year now and have washed it several times and no bleeding at all. My bedroom is grey with purple window treatments. I needed a new comforter but had a difficult time finding purple much less purple with grey. Haven't received it yet but am hopeful it fits well in color..
Purple favorite color. Nice modern design. Machine washable. Complete bedding set. Reversible.